Your tone - your personality - and sometimes nothing more than a user setting can represent a product. BIAS AMP 2 is the best designer of a virtual guitar amp that truly recreates the tone and feel of real tube amps, allowing you to mix and match components to create the perfect amp. 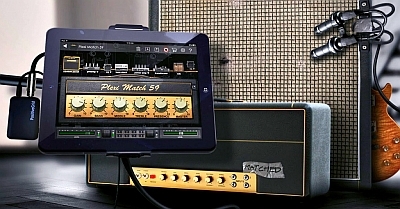 You can use Amp Match to clone the tone of real equipment or a guitar track. BIAS AMP 2 is a revolution in the design of a virtual amplifier, providing the tools to bring your finished guitar tone to anywhere - from studio to stage and back. Create your own amp - BIAS AMP gives you the ability to create new sounds of your own dream amplifier, allowing you to replace lamps, customize preamps, power amplifiers, transformers, tonal stacks, use multiple microphones and open / closed cabinets and all through a powerful and intuitive photo-realistic interface. Regardless of whether you are a classic rock musician, metal musician, jazz player, bluesman or singer-songwriter, and whether you understand how amplifier electronics work or not, you will create exclusive tones in an instant. AMP Match - AMP Match can adjust to the tone of any reference amplifier, and we made it even better in BIAS AMP 2: now matching the tones is as easy as importing a sound file! If you are not all familiar with the work of amplifiers, AMP Match will be able to transfer the sound for you. Amp Packs - By uploading custom packs, you can easily create your own tone. BIAS AMP 2 adds two new customizable amp packs to your sound palette. Blues are clean, mid-range amplifiers, and Bass are amplifiers and cabinets for bass guitars. Add to all custom parameters and you have literally thousands of custom amplifiers on hand. Dynamic Response - For BIAS AMP 2, we worked with artists, engineers, and recording studios to improve the hyper-authentic emulation of amplifier circuits. The result is a new experience with increased sensitivity and dynamics. Thanks to new lamps, a transformer, dynamic tone control and a completely redesigned guitar cabinet with the ability to work with multiple microphones, you now have the tools to help you conduct sound research further. BIAS & CELESTION - When it comes to speakers, Celestion is the most trusted name in rock and roll history. Their electrodynamic loudspeaker heads were used in classic tones more often than any other manufacturer, and their pulse reverb response is a favorite of guitarists, ranging from Pete Thorne and Scott Henderson to George Lynch. We collaborated with Celestion to make their IR more convenient than ever before, so you can forget what to download third-party files! Simply select the regular Celestion booth and start moving the microphones - BIAS AMP 2 does the rest. Magnificent reverb - BIAS AMP 2 has nine built-in reverberations - from huge halls to small rooms - with full control over their size and character. Between the different types of reverberation and advanced filtering and carbonation options, BIAS AMP 2 covers all your reverb needs. The powerful eco-system - BIAS AMP was developed to integrate directly with the flagship software BIAS FX, Amp-and-effects Positive Grid. All custom amplifiers created with BIAS AMP 2 are automatically available in your BIAS FX, providing the basis for your ideal finished tone. Start with an amp that fits your BIAS AMP 2 game, then open it in BIAS FX and add effects to the pedal and effects rack. This is a seamless and revolutionary workflow that makes it easy to create your own custom tones!